So in my last post I wrote that my sister offered me a one-off opportunity to work on a professional children’s show in Bangkok for a week. If you read that post you would have heard all about my Bangkok adventures – the good, the bad, and the eye-watering. This week I bring you the second instalment of my week in Bangkok– working backstage on a professional children’s show. A quick recap: One day in the not so distant past my big sister called and asked me whether I would like to work on one of her shows in Bangkok for a week. My response was swift – “Hell yes” – even before she told me what would be involved. To be fair she could have told me anything and I would have agreed to do it, especially after she told me that my flight, accommodation, food and local travel would all be paid for by the company. Not only that, I would get paid for my work on the show (insert happy dance here!). So what was the job? I can reveal that the job was…drum roll please… ta dahhhhhh – Wardrobe and Props Assistant (WaPA for short) for a show called ‘The Little Big Club’. And what does a WaPA do? Well I am so glad you asked! The clue is hidden cunningly in the name – I would be assisting with the wardrobe and props for the show. This job was an interesting choice for me as I have never been ‘at one’ with a needle and thread (I generally use a stapler or sticky tape to fix any hems on my clothes or I pay someone to make alterations for me). But hey, I knew how to thread a needle and I could put things together so I felt sure that I could assist (and I emphasise the word assist here) with all manner of prop and costume requirements. I certainly wasn’t going to miss out on this one-off opportunity to do something new and exciting! Day 1 work schedule: unload props; ‘build’ change-rooms; set up Dino pit; unpack, check and hang up costumes. On my first day on the job in Bangkok the crew were greeted at the hotel by one of the promoters in a very plush vehicle. Door to door luxury service for the crew’s first day – no hassle, no fuss. I liked this gig already. Entering the venue via the service lift (which had the most god awful rubbish smell – hello Bangkok) I was astounded to see it was a vast cavernous room; no seating, no stage. “Riiiiight then. How in the hell does this work? !” I thought to myself. I soon learned that a local crew would be building the auditorium from scratch – seating, stage, light rigs, the works. And all in less than two days. Impressive. Buzzing with excitement I entered what was to be the backstage area where I was greeted with a mass of very large packing crates. “Our first jobs will be to set up the wardrobe areas and the Dino pit” I was advised by the Wardrobe and Props manger. Um, ok then. A Dino pit. Sure, no worries; I can do that, if only I knew what a Dino pit actually was. I guessed I would find out soon enough. After setting up the dressing areas it was time to set up the Dino pit. There were four extremely large packing crates which we arranged into a diamond shape with plenty of room around the crates to allow for four people to get dressed, along with enough room to enable the crates to be opened fully. We then began opening the crates one by one. And that’s when the full meaning of Dino pit became clear, because inside the crates were – yep you guessed it – dinosaur costumes. But not just any old dinosaur costumes. Barney the friendly dinosaur and his friends Riff, BJ and Baby Bop. (Don’t know who they are? That’s ok, neither did I! 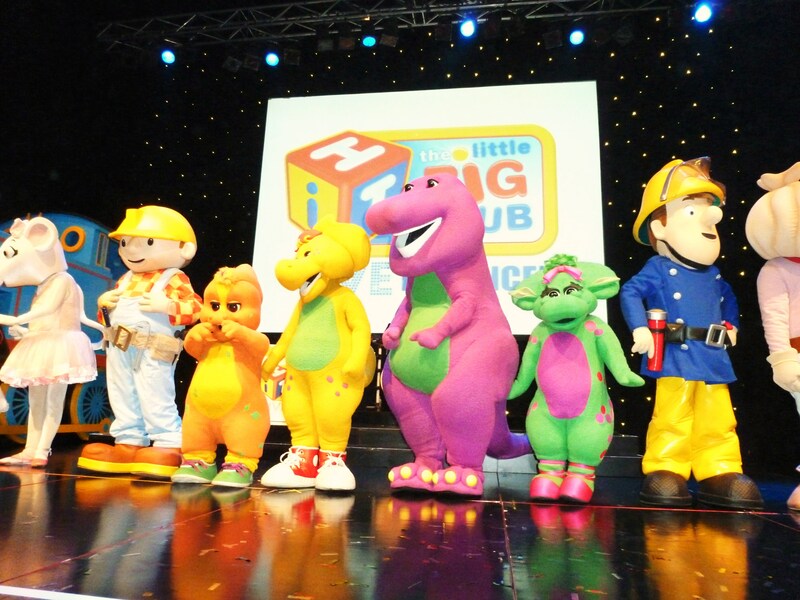 For the uninitiated they are the characters from an American children’s TV show who perform fun educational songs and dances – kind of like the Wiggles if the Wiggles were dinosaurs. Don’t know who the Wiggles are? I suggest a Google search then!). These costumes were big. Big and heavy. Big and heavy and with all sorts of separate pieces which would eventually fit together to form full costumes. The rest of the day was spent sorting out the costumes and props. Apart from the fact I still had no idea what I was doing and was feeling totally out of my depth I enjoyed my first day on the job. Day 2 work schedule: build props; groom costumes. On Day 2 we headed back to the venue to continue where we left off the day before – grooming the costumes to ensure they were in pristine condition after being in packing crates (including steaming every costume and scrubbing all of the shoes), and re-building the props (props are taken apart after the end of a run of shows in order to be transported in packing crates to the next show destination). Somehow the hours flew by and before I knew it it was time to head back to the hotel and the evenings’ festivities. Day 3 work schedule: set the stage for the first on-stage run-through; costume fittings; ad hoc prop and wardrobe requirements. Day 3 saw the crew heading back to the venue for more setting up and organising, along with the first run-through on the newly-built stage, and costume fittings for the cast. My big moment #1 had arrived – working out how the costumes were to be put on each performer. (e) the costumes are in pristine condition (i.e. no random fluff / thread etc is attached to the outside of the costume). I was soon to learn that most of the performers had more than one character costume throughout the course of a show and would therefore require at least one change in costume during a performance. I further learnt that when changing costumes, one cannot just leave the costume lying anywhere. No; once off the costume must be hung back up in order to protect it and to help dry it out before its next wear. The dinosaur crates even had their own in-built fans to help with the drying process (oh yes, those costumes get awfully sweaty inside). Still further I was told that the costumes could not be worn for extended periods of time due to the heat factor and the weight of the costumes (the Barney costume alone weighs upwards of 25kgs). So when not on stage (or undertaking a costume check) a performer needs to be helped out of their costume immediately. Hence the need for wardrobe support! During the initial fitting process the cast kept asking me questions that I was not equipped to answer and I was feeling quite out of my depth. Bless them though; they were so lovely and friendly and luckily had worked with the show enough times to muddle through the initial costume dressing with me. Every single person in the cast was truly a delight to work with. Soon enough big moment #2 rolled around; a moment that I was hoping would never transpire. Oh yes, I was required to do some sewing – dear god in heaven above; me, sewing! But it was my job and I was determined to do it well, so I picked up the sewing kit, threaded the needle, and set about fixing the costumes like my life depended on it. And you know what? I did a pretty good job. Seems given the right incentive anything is possible! And then it was time for me to finally see the show in action and work out how my role would fit into the running of the show. At this point I was assigned the characters that I would be responsible for dressing for each show and advised of the props that I would also be responsible for. I had my running sheet that listed everything that needed to be done and I carried it around like it was the most precious jewel in the world. During the first run-through I realised that I would be running around a lot backstage during the show, and that there were some serious time pressures with regard to the costume changes; but there would also be times during the show when I could stand at the side of the stage and dance and sing along – excellent! We ended up spending many hours in the theatre that day. At times I felt quite overwhelmed, but most of the time I just loved being a part of it all. Day 4 was all about the rehearsals (the cast had already been in rehearsals, but the crew had yet to rehearse). First up was a technical rehearsal to iron out the running of all things technical in the show. Then came two dress rehearsals – one in Thai, and one in English. Oh yes, there was going to be both English and Thai shows. The Thai shows were going to be tricky for both the crew and the cast as all of the dialogue was to be in Thai and none of the cast or immediate crew spoke Thai. “Ok then,” I can hear you thinking (why yes I have a very powerful psychic ability don’t you know) “so if the performers don’t speak Thai, how does the show work?” Ah, good question. For the Thai shows the performers would lip-sync to a pre-recorded track with Thai speakers (think Britney Spears), and the crew would have to concentrate harder to ensure that they didn’t miss an important cue. Hence the need for extended rehearsal time. Walking around backstage with all of the costume characters was very surreal. And the conversations…! Unfortunately I am not allowed to divulge any more detailed information about working backstage with the characters; so no stories about the weird and wonderful things I saw, heard or had to do. Nor am I allowed to share any photos of undressed characters. In fact, I wasn’t allowed to take any photos in which a costume was not on a person, or where a person was not fully dressed in a costume. There are many rules and regulations which dictate the whys and wherefores with regard to the costumes (all written and enforced by my big sister with her casts and crews all over the world), and any flouting of these rules can see the distributors lose their license to put on the show. There are a lot of good reasons for this and I do understand why the rules are in place. It’s just such a shame I can’t share the stories with you – there are some hilarious ones. But at least it will save your bum from getting numb reading this post as if I was to share all of the stories you would be reading this post all day! The next two days were long and tiring with the show finally going live. There were six shows in two days, and each show was close to two hours long (including interval). Before and after each show, props needed to be set in position, costumes needed to be checked and re-checked (and fixed as required), and performers needed to be dressed and undressed. And there were also ‘meet and greets’ with some very lucky children that needed to be scheduled in. There certainly was a lot to do. But despite the long hours and the work, I loved nearly every minute of it. Watching the show come together was a wonderful experience. There is nothing in the world quite like a live stage performance. Arriving at the theatre early the next morning we were met with a bit of a crisis – the costumes had been returned from laundering but were not dry. Okey dokey, so with less than 70 minutes before show time we had wet costumes, a tool belt that needed re-attaching, and some props to fix. Best get to it then. Whoever thought this job would be glamorous has never sat on a chair with a hair-dryer trying to dry trousers whilst people are running around setting up fans to dry underwear and bodysuits, and socks are drying on lighting rigs! As the Wardrobe and Props manager was caught up in some other costume drama it fell to me to reattach Bob the Builder’s tool belt. “Just to let you know if the tool belt falls off while Bob is on stage the show licence could be revoked” I was told. “You also need to keep the sewing as neat as possible so that it doesn’t ruin the look of the costume”. Ok, no pressure then. With just 30 minutes until Bob was due to be on stage off I trotted to fix the belt armed with a little sewing kit and with the words “can you fix it? Yes I can!” going around and around in my head. Operation re-attach Bob’s tool belt started well – I worked out the correct way to position the tool belt on the almost-dry costume and had successfully threaded the needle. I quickly realised that there was a lot of sewing to be done, and with little time left to achieve it I was feeling pressured. But I continued to sew like my life (or at least the license) depended on it. During the sewing I managed to prick my finger which then bleed on the costume – argh! Luckily the stain was removed easily enough and a plaster was applied to stop any more spillages. The incident, however, had slowed down the sewing. With just 10 minutes before Bob was due on stage (which meant he needed to get dressed ASAP) I quickly finished off the sewing and helped him get dressed. Once dressed I then made him jump and run around to ascertain whether my stitching would hold up. It seemed ok, and with no time left he made it onto the stage where, I am pleased to say, the belt did not fall off. Phew! 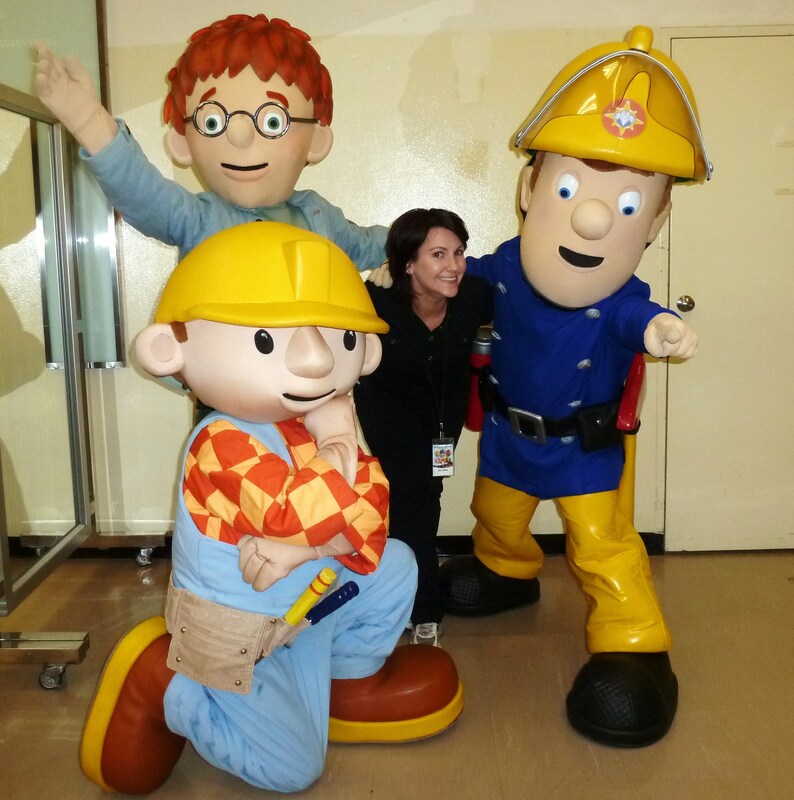 During my breaks in work throughout the shows I had a lot of fun dancing and singing on the side of the stage (c’mon, who doesn’t feel the urge to dance along to children’s songs every now and then?). I think the cast enjoyed the fact that I was loving the show and dancing like a crazy person – they either ended up joining in backstage or encouraging me subtly from onstage. After the final show it was time to bump-out (or in layman’s terms, take down the entire stage and pack the props and costumes into packing crates to be sent to their next destination). Sounds easy right? Wrong again! My first job was to take a travel-sized hair dryer and dry the inside of each of the dinosaur costumes. To do this I had to position myself in such as way as to reach the hair dryer inside the costumes which was very awkward – lucky I am flexible is all I can say! And I had to be very careful not to burn the lining of the costumes. Glamorous job? I think not! An hour of drying later I was then tasked with packing away the other character costumes in their designated packing crates, another tricky task. Thankfully my big sister came in to help me which made all the difference to the speed and precision of the process. Finally all 12 costumes were dry and packed and we were able to leave the venue for the very last time. It was a long and tiring day but the crew still managed to get together back at the hotel to toast a job well done. Challenge week complete! So what did I learn from all of my firsts this week? Gosh where to start! I learnt how hard a back stage crew works before, during and after a show. Having only been an amateur onstage performer until this time I really didn’t have any concept of the hard work that crew members put in to make sure a show runs smoothly. Thank you to all of the crew members of every show I have ever done, and to all crew members of any show I have ever seen and am yet to see. You guys are amazing and deserve much more credit for the work that you do. I learnt that when I am faced with a situation in which I am forced to do something that I have not done before, I am generally able to complete the task with a minimum of fuss and bother. I guess sometimes we all just need a bit of pressure to help us get off our butts and give something a go. I have learnt that I can sew a tool belt onto a pair of XXXXXXXXL sized overalls. I am sure that skill will come in handy one day. I learnt how hard it is to wear a costume character suit. I genuinely don’t know how they are able to walk in those things, let alone sing and dance. For those who think that this would be an easy gig – think again. It is difficult to see out of these costumes and they are hot and heavy. I have much respect for the performers who wear these costumes now that I have tried one on for myself and have helped others with theirs. I have learnt that I seem to have verbal diahorrea when it comes to talking about fun and exciting experiences. And finally, I have learnt about what my big sister does as an Executive Producer, and how fantastic she is at her job. I had a vague idea of her job before working with her on the show, but now I can see why she is so respected in her field and why she is clearly feared and loved in equal measure by cast and crew alike. Not a lot of people get an opportunity to work with their family members to see what it is that they do for a living, and I feel lucky that I have had this opportunity and can now have an informed conversation with her about her job. Big sister: thank you for providing me with the opportunity to work on this show and trusting in my ability to get the job done.